Pandemic is a cooperative game. Unlike other recent coop games, it does not have any kind of traitor mechanism. It’s all the players against the game, and either they all win, or they all all lose. 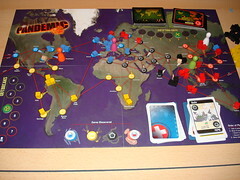 To begin with, players decide on the difficulty for the game and, accordingly, the number of Epidemic! cards. Shuffle 4 of them in the draw pile for an easy game with new players, or up to 6 of them for the heroic game. Each player is then randomly given one of the 5 role cards. Since the maximum number of players is 4, there will always be one role missing… but more on that later. Players also receive a number of hand cards and the pawn of their role’s color and put it down in Atlanta, right next to the first research station. Finally, the world map is seeded with diseases by drawing city cards from the infection pile and placing one to three disease cubes in the appropriate color to that city. One disease cube is enough to keep the local hospitals quite busy, while three disease cubes herald an imminent disaster. he can travel around the world, meet interesting people and try to keep them alive. He can just drive to any neighbouring city, fly to another city by playing the card for either his origin or destination, or can fly from one research station to another. The Dispatcher can take these actions for another pawn as if it were his own. He can also move a pawn to any city where another one is waiting already. build a research station. By discarding the card for his current location, the player can build a research station in order to travel to and from that city more quickly, and in order to discover a cure. The Operations Expert does not need a card. He simply spends an action to build a research station at his current location. discover a cure. A player that is in a city with a research station can discard five cards of the same color to discover a cure for that disease. The Scientist only needs 4 cards. After a cure has been found, the disease is not automatically eradicated, but treatment becomes much easier. treat a disease. For every action spend on this, the player can remove one disease cube from his location. After a cure has been discovered, all cubes of that color can be removed for only one action. The Medic can remove all cubes of one color for one action even before the cure is discovered. After the cure is discovered, he doesn’t spend an action any more, he heals people the second he enters their city. share knowledge. Players can pass cards to one another for one action per card. To do this, they both have to be in the city that is on the card, but it does not matter if the current player is giving or receiving the card. The Researcher may give any card to other players in the same city. After taking her actions (or passing), the player draws new cards, hoping it’s not an Epidemic! card. Before the next player, it is now the virii’s turn. Up to four cards, depending on how advanced the game already is, are turned over from the infecion pile and one disease cube of the appropriate color is added to that city. If a city would have more than 3 cubes of the same color by adding this cube, no cube is added. Instead, there is an Outbreak. One cube of this color is added to each of the surounding cities – and yes, chain reactions can and do happen. 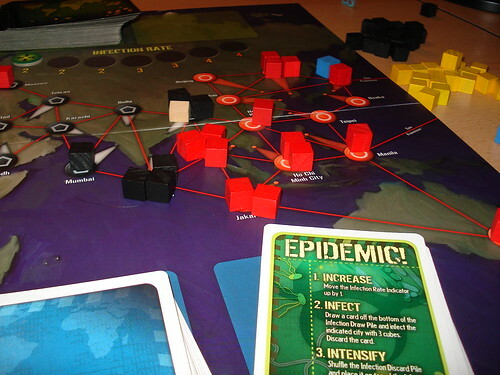 Each Outbreak is one step closer to disaster and the demise of mankind, so a chain reaction of 3 outbreaks can often be a disaster that the players will not recover from and must be avoided. Speaking of things to be avoided: remember the Epidemic! cards? They can’t be avoided, but you will wish you could. Epidemic! cards increase the number of cards from the infection pile that are turned on the virii’s turn. Worse, for every Epidemic! card, a card is drawn from the bottom of the infection pile and immediately infected with three disease cubes. And still worse, the infection card discard pile is now shuffled and placed on top of the infection pile. So all your favorite cities that have half their population infected allready are about to come back now. Remember that the Epidemic! actually happens before the infections for this turn, so some of them will come back before you even have a chance to do anything about it. On the other hand, the only way to win is discovering all four cures. It is not necessary to heal everyone, but the vaccines must be discovered. While all the losing conditions seem very far away in the beginning – the player card pile is high, and there is lots of colorful wooden cubes still – that impression is deceptive. As the game progresses, the number of disease cubes that must be added grows. And while the remaining cards on the player draw pile may be predictable, when it gets close to the end you will start wondering if that one card you desperately need is still in there or not. Every card exists only once in the pile, so the decision should not be made lightly if you use them to fly to Osaka, or save the card for the urgently needed cure for the Red Pocks. The advantage of using one card less to discover a cure, for example, often makes it worth to wait one more turn so the Scientist can do the research insted of someone else, thus saving one card. Just as often, waiting that one turn is a luxury you do not have. Like many other things in Pandemic, there is no right or wrong way to manage your cards. It all depends on the initial spread of the diseases, your luck in drawing cards and the roles you have available. Since there is 5 role cards, but only at most 4 players, you will be missing at least one role in every game. The roles are pretty well balanced and no combination of them makes the game significantly harder (we did find games with a Dispatcher slightly easier than games without him), but depending on what roles you have available, the strategy will change noticeably. If your game lacks the Medic, you are forced to work on the cures much faster because you lack the ability for damage control. If, on the other hand, your game has no Researcher, you can expect it too last a bit longer because you spend your time curing people that you just know are going to be sick again 2 turns later, while patiently assembling the right set of cards. 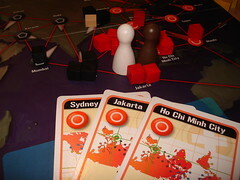 No matter which roles you have and which continent suffers most, the only way to win Pandemic is thorugh communication. Especially in the heroic game with 6 Epidemic! cards, every move must be planned, preferably one round or more in advance. You have to find the right balance between research and damage control, you have tomake good use of all role abilities, and especially you have to be in the right place at the right time. This focus on planning and communication is what makes Pandemic fun and unique – but it must be said that it is also what can make Pandemic incredibly unfun. If your group has one person that is a strong communicator, the other players can feel like pawns executing his plans at times. This didn’t actually happen for us, but only because we are all loud people here. If you are a fan of cooperative games – or want to test the waters and maybe become one – Pandemic is definitely worth picking up. It does a great job at causing an increasing amount of urgency as the game progresses the same city gets infected yet again, while the draw pile is slowly running out. It also offers a greater amount of replayability than other coop games since the different roles and different disease spreads in the beginning make you think about your strategy again in every game. 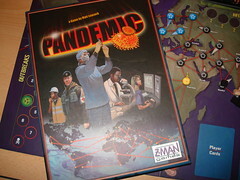 You will most likely not enjoy Pandemic if you prefer playing without a lot of planning. But if you’re looking for a challenging but beatable coop game, chances are you will have a blast.